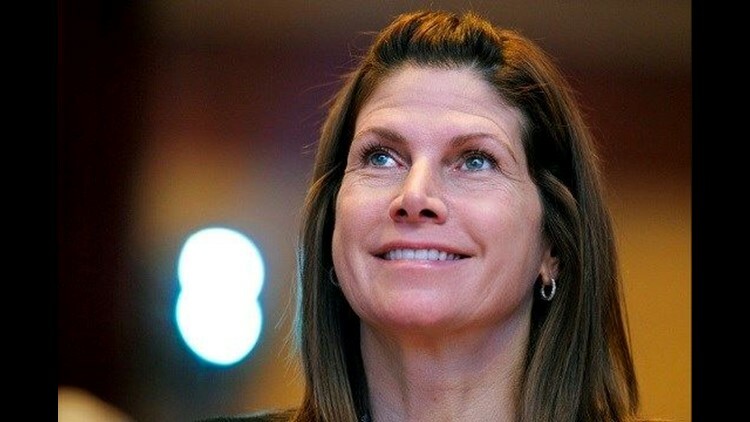 WASHINGTON (AP) — For years, Republican Rep. Mary Bono endured the increasingly suggestive comments from a fellow lawmaker in the House. But when the congressman approached her on the House floor and told her he'd been thinking about her in the shower, she'd had enough. As reports flow almost daily of harassment or worse by men in entertainment, business and the media, one current and three former female lawmakers tell The Associated Press that they, too, have been harassed or subjected to hostile sexual comments — by fellow members of Congress. The incidents occurred years or even decades ago, usually when the women were young newcomers to Congress. They range from isolated comments at one hearing, to repeated unwanted come-ons, to lewd remarks and even groping on the House floor. Coming amid an intensifying national focus on sexual harassment and gender hostility in the workplace, the revelations underscore that no woman is immune, even at the highest reaches of government. "This is about power," said former California Sen. Barbara Boxer, after describing an incident at a hearing in the 1980s where a male colleague made a sexually suggestive comment. The colleague, using the traditional congressional parlance, said he wanted to "associate" himself with her remarks — adding afterward that he also wanted to "associate with the gentle lady." Boxer said the comment was met with general laughter and an approving second from the committee chairman. She said she later asked that it be removed from the record. "That was an example of the way I think we were thought of, a lot of us. ... It's hostile and embarrasses, and therefore could take away a person's power," she said. Boxer and the other female lawmakers spoke on the record to tell their stories in the wake of revelations about Hollywood producer Harvey Weinstein's serial attacks on women, as well as disclosures from current and former Capitol Hill staffers about harassment by lawmakers and aides. Those accounts, published in The Washington Post and elsewhere, revealed that Congress has few training or reporting requirements in place to deal with sexual harassment. Largely untold before now is that some female lawmakers themselves say they have been harassed by male colleagues. While rare, the accounts raise troubling questions about the boys' club environment in Congress where male lawmakers can feel empowered to target not only staffers but even their own peers. The lawmakers declined to identify the perpetrators by name, but at least two of the men continue to serve in the House. None of the female lawmakers interviewed reported what happened, and some noted it was not clear where they would lodge such a complaint. At least three of the four told friends or aides about the incidents, which in some cases were witnessed by other lawmakers. "When I was a very new member of Congress in my early 30s, there was a more senior member who outright propositioned me, who was married, and despite trying to laugh it off and brush it aside it, would repeat. And I would avoid that member," said Rep. Linda Sanchez, D-Calif. She added that she would warn other new female members about the lawmaker in question, but she declined to identify him, while saying he remains in Congress. "I just don't think it would be helpful" to call the lawmaker out by name, Sanchez said. "The problem is, as a member there's no HR department you can go to, there's nobody you can turn to. Ultimately they're employed by their constituents." Bono said she ultimately confronted her colleague on the House floor after he'd made repeated harassing comments. Bono, who arrived in the House at age 36 to replace her husband Sonny Bono after he died in a skiing accident, said it seemed like the lawmaker didn't know how to talk to a woman as an equal. "Instead of being 'how's the weather, how's your career, how's your bill,' it was 'I thought about you while I was in the shower.' So it was a matter of saying to him 'That's not cool, that's just not cool.'" "I don't think I'm the only one. What I tried to do was ignore it, turn away, walk away. Obviously it's offensive. Are you supposed to be flattered? No, we're adults. Not appropriate," said Solis, who left Congress in 2009 to join the Obama administration as labor secretary. The experiences occurred against the backdrop of broader gender inequities in Congress, where women remain a distinct minority, making up only about 20 percent of members in the House and Senate. That's up from fewer than 10 percent in the quarter-century since politics' Year of the Woman in 1992. That election season, large numbers of women sought office following hearings by the then-all-male Senate Judiciary Committee over Anita Hill's testimony about alleged sexual harassment by Clarence Thomas, who was subsequently confirmed to the Supreme Court, albeit by a narrow margin. The increase in numbers and the prominence of a few individual women, such as House Democratic Leader Nancy Pelosi, has not resulted in parity in all measures, nor eliminated the potential for male members to demean or even harass their female counterparts. Nonetheless, a few former female lawmakers contacted by The AP expressed surprise and even disbelief at the notion that lawmakers themselves could be victims of harassment. Rep. Jackie Speier of California has recently gone public with an account of being sexually assaulted by a male chief of staff while she was a congressional staffer. She has criticized the vague rules in place on the issue and is preparing legislation to mandate sexual harassment training for congressional offices, among other changes. In a video posted to Twitter last week, she called Congress "a breeding ground for a hostile work environment" and encouraged others to come forward. Yet when it comes to lawmakers themselves, Speier said: "I think the women in Congress are big girls. The equalizer that exists in Congress that doesn't exist in other settings is that we all get paid the same amount and we all have a vote, the same vote. So if you have members that are demeaning you it's because you're letting them." Former Rep. Ellen Tauscher of California flatly argued that harassment can't take place between members of Congress. "Female members and male members are equals, they don't sexually harass each other," Tauscher said. "Formally, two members of Congress may have the same status. That doesn't change the fact that sexual harassment can occur between peers," Drobac said, noting that numerous other factors can come into play, including the difference in age and length of service between the members, and the mere fact that men have more power in society than women. Indeed the harassment or hostile incidents experienced by current and former lawmakers occurred when they were young newcomers to Congress, with less seniority than the men who targeted them. Yet the fact that some dispute whether harassment could even occur between members of Congress underscores the complexity of the issue and the fraught questions surrounding it. Bono said she found power in confronting her harasser, and that after she did so it never happened again. She emphasized that she understood her experience was different than those of young staffers who may face harassment from someone they rely on for a job, and that she was fortunate because as an equal elected by her constituents, she would not fear retaliation. "My career didn't suffer, I didn't suffer," Bono said. "But it did happen."